I am the kinda guy that likes to eat well on long backpacks, and keep up with the latest in technology. So when I unwrapped a brand new, state of the art MSR Dragonfly backpacking stove for my birthday, I was excited. The Dragonfly is the latest attempt by MSR to "civilize" backcountry food preparation. Given that MSR is responsible for what - in my opinion - is one of the two best backpacking inventions of the last 15 years: the Whisperlite Stove (the other being Crazy Creek's Chair), I was full of anticipation. I shouldn't have been. MSR makes some great products. The Dragonfly is not one of them. Years ago, stove manufacturers realized that they could reduce the weight of the device by making the fuel bottle do double duty as the stove's fuel tank. 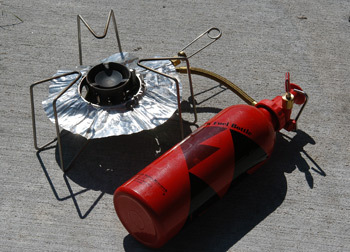 This was one of the radical changes in one of MSR's first stoves, the XGK, and it was soon incorporated into the design of the first Whisperlite. The approach has now been copied by several manufacturers. Basically, a pressurizing pump and on/off valve screws into the fuel bottle (not included), and feeds fuel to the burner. The Dragonfly adds stability by having great fold-out, pot support/leg units. The result is the most stable backcountry stove I have ever used. It weighs 17.5 oz. But the design feature that sets the Dragonfly apart from most other MSR stoves is that it can supposedly simmer food. The Dragonfly has a separate, adjustable valve on the burner assembly that you can use to reduce the fuel flow to the point - theoretically - where you can really simmer stuff. If you are thinking now: "At least this stove produces enough heat to really bring the water to a boil," think again. In a word, the Dragonfly is slow. Verrryyyyy slowwwww. Excruciatingly slow. In tests in our garage (elevation 1060 feet), once from a cold start, and once from a hot start, the Dragonfly required an average of 14 minutes to bring 2.0 liters of water to a rolling boil. In contrast, the Whisperlite did it in 9 minutes. To be sure, the Dragonfly is not wasteful: it used exactly the same amount of fuel (53 grams) to boil those 4 liters of water as did the Whisperlite. Thank goodness for small favors. But the most notable feature you get for your extra 3 oz of weight is noise. Loud, distracting, wildlife chasing, conversation stopping noise. During the aforementioned field test, my hiking buddies made comparisons to space rockets and blowtorches. One suggested I was a welder on a "busman's holiday." The noise was so bad that my wife wanted us to cook off by ourselves, so we - or rather our stove - wouldn't ruin other folk's evening socializing. (But our friends wanted us to stay in the cooking ring - probably so they could heap more abuse on us and our stove.) (The reason for the noise is that the Dragonfly uses a burner similar to that of the MSR XGK stove - once referred to as Krakatoa in one of Backpacker's earlier gear reviews - and the Svea 123.) In a way, it is amazing that the MSR folks moved away from one of the great advantages of the Whisperlite: its quiet. I guess it amounts to a retro approach to stove design. Oh, did I mention one other design "feature"? To protect this finely tuned "simmering" valve, the MSR engineers put a fuel filter in the fuel intake line. What do you do when (not if, but when) the fuel filter plugs? Since there appears to be no way to remove it, you must have to send it back to the factory for replacement. Now THAT'S the kind of stove I want to take deep into the wilderness, for sure!! OK, now for a bottom line. If you really need to have a good simmering stove, buy a Coleman Apex II, and just deal with its flimsy design and gluttonous fuel consumption. If you want a good solid, quiet, pretty stable, fuel efficient, easily field maintainable stove, buy a Whisperlite Shakerjet. But if you want a really stable, fuel efficient, heavy, expensive, very slow, incredibly noisy, and non-field maintainable stove, buy an MSR Dragonfly. And have a great hike. Just don't expect to eat dinner with your friends. MSR Dragonfly, Opus II: Lemon or Lemonade? Ah, the power of the press. If you remember, for the November issue of the Tennes-Sierran, I had written a review of MSR's new Dragonfly backpacking stove. The review was not very complimentary. In a nutshell, my opinion of it was, that while it is the most stable backpacking stove I had ever seen, it was noisy, slow, and seemed to have a design flaw that made it less than perfectly field maintainable. Well, about a month after the article came out, I was contacted by Jennifer Gombas, of MSR, who suspected - after having read the review - that the stove I had received for a birthday gift in August was a "lemon," and sent me a replacement Dragonfly. She encouraged me to give it a try. Being a scientist (if we use the term really loosely), I could not resist the opportunity to do a head to head comparison, between my first Dragonfly and the new one. Now, you are probably thinking: Lordy, this guy really needs to get a life: why would he double his time standing at the edge of his garage on a frigid Sunday morning. If he did such a good test before, why repeat it on the old stove? Of course, the answer lies in the frigidness of that Sunday morning. It was cold - for Tennessee. Hovering around 25 degrees or so. A stiff breeze out of the south, and the tap water I was using felt more like it had just flowed out of a glacier, rather than a faucet. Dramatically different conditions from when I did that first test on a warm August afternoon. The results: in a word, Jennifer of MSR was right: I had gotten a lemon the first time around. To be sure, both stoves were still very noisy, and both very stable. The big difference was in the time it took to boil 2 qts of water. The old Dragonfly was slow. Excruciatingly slow. Under the test conditions (your mileage may - no will - vary, depending on the environmental conditions), the old Dragonfly required 20.1 min to boil the water from a cold start (13.1 min from the hot start). The new one did it in 12.4 and 9.8 minutes, respectively. These latter times are perfectly respectable. And the new Dragonfly seemed to do a better job of simmering. (This was done in a separate test.) Now mind you, it is no Coleman Apex II. The Apex II is the champion of all stoves when it comes to simmering. Of course, it is also flimsy and a fuel hog, and would be a bear to field repair. In contrast, the new Dragonfly simmers, but the adjustment is touchy, and it probably simmers a big pot of food better than a small one. It did use about 10% more fuel than the old Dragonfly, but it is still a miser compared to the Apex II. And a final note on the new Dragonfly. MSR now supplies a field replaceable fuel filter. You have to dig the old one out with a safety pin or a fishhook, but at least it is a start. Don't forget to carry that spare with you. But wait, did not I opine in the earlier article that MSR had come up with one of the two best backpacking inventions of the last 15 years: the Whisperlight stove? You bet. So just for fun, I pulled out my 2-year old Whisperlight Shakerjet stove and fired it up. How did it do? It beat the new Dragonfly by 0.7 min. Not a lot, but it was interesting. Admittedly, the Whisperlight does not simmer very well at all, but it is quiet, and I have never knocked a pot off it yet. OK, so where does this leave us? Well, I could rant and rave about poor quality control in the MSR factory, but I won't, because I don't think such a claim is relevant. Frankly, we all make mistakes, and a company like MSR, that has made a line of wonderful products for decades, is certainly entitled to one - every now and then. Of course, it would have been nice to test several models when I got the first one: I could have easily seen that the first one was a lemon. But even Consumer Reports doesn't test multiple versions of products. But hats should go off to MSR for following up on what was, admittedly, a pretty negative review. To track me down (I still don't know how they did it) was a sign that they are in fact a quality company that makes quality products. But now that the new Dragonfly works like it is supposed to, would I really use it, given some of it's drawbacks? Here's where we get into a lot of personal preferences. You may like a big Ford Expedition to get you around town when there is a dusting of snow. I like my Honda Accord just fine. You may be perfectly happy with a small home computer from which to handle letters, recipes, and email. I have to have the biggest, most powerful one I can reasonably get my hands on to do terrain modeling. It is just a matter of taste. Maybe a better question is, now that I have spent more than a week in the field with it, what kind of uses would I recommend it for? Probably if you are going on a trip with lots of folks, and have a community "kitchen," which is far away from the main group, or if you have big pots or frying pans you like to use, and you want to simmer, then the Dragonfly would be a fine stove. It is stable enough to withstand World War III. Or if you like company on solo backpacks, the noise can make you feel like there are a lot of folks out there with you. But if you want to sit in a circle of friends, exchanging pleasantries while everyone prepares dinner, well, just be prepared for a few snide remarks about blowtorches.